Beetles and Butterflies and Birds. 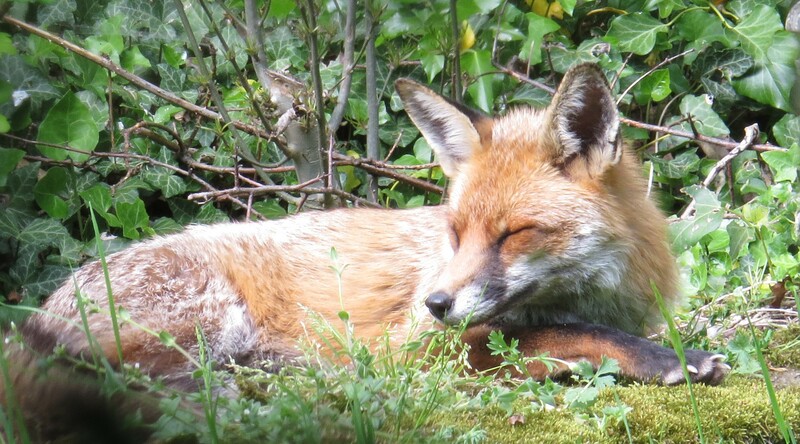 And Foxes. Dear Readers, when I first met my husband he was not very interested in animals. He hadn’t had pets as a child, and was much more interested in ancient history than birds and bugs. But see what fifteen years of marriage can do! 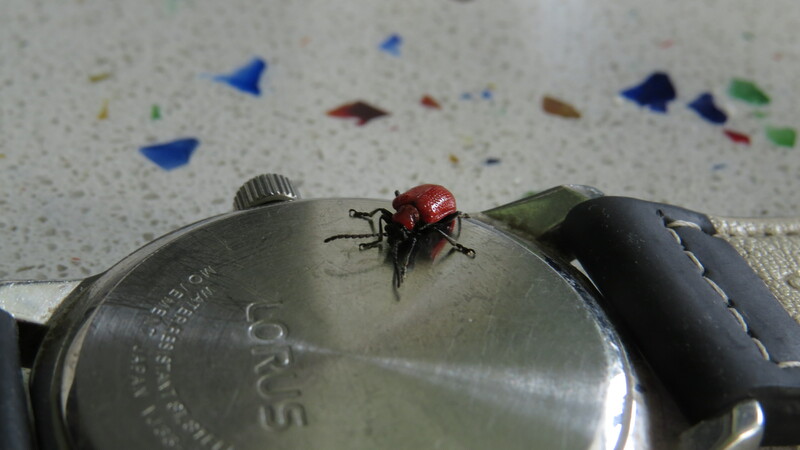 I am now interested in dusty ruins (in fact we went on holiday to Libya before that particular situation went, as we Brits say, pear-shaped) and earlier this week, John called me downstairs to identify this little red beetle. ‘It’s squeaking!’ he said, in hushed tones, as the beetle disappeared under his watch strap. And indeed it was making tiny irritated noises. I have tried my best to capture them for you, but to no avail. The video is below, but you’ll have to take my word for it that our little insect friend was complaining. My gardening friends will no doubt recognise this creature with a shudder. 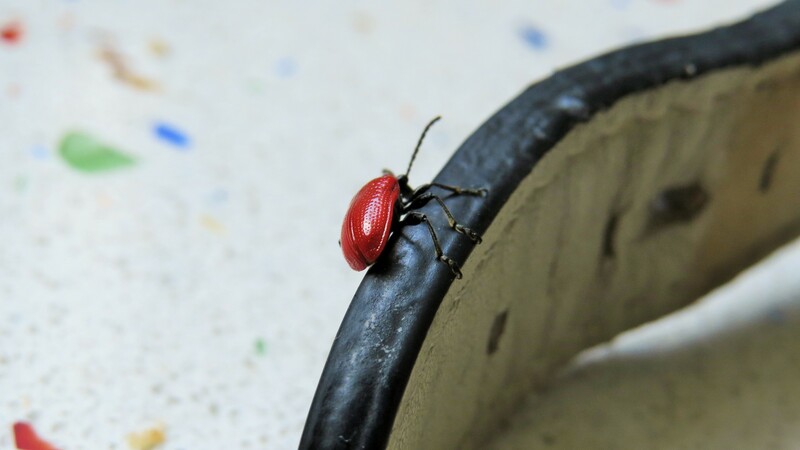 With the Latin name Lilioceris lilii and the common name ‘lily beetle’ one can be under no illusions when it comes to this insect’s choice of dinner.This is rather a shame as, in its smart red and black livery, this is a most handsome beetle. Lily beetles lay their eggs not only on lilies, but also on fritillaries and Solomon’s Seal, and indeed I saw one (maybe even the same one) on the seed head of one of my snakes’ head fritillaries. Such gratitude! The female will lay several hundred eggs on the stems and leaves of her chosen plant, and the larvae slowly munch away, covering themselves in sticky black excrement as a protection. I should definitely have flicked the one that I ‘rescued’ into the bamboo at the back of the garden, where at least it would have had a longer walk/fly before it could start to munch my plants. It has been a generally good week for insects, what with all the sunshine and the temperatures in the 20’s. 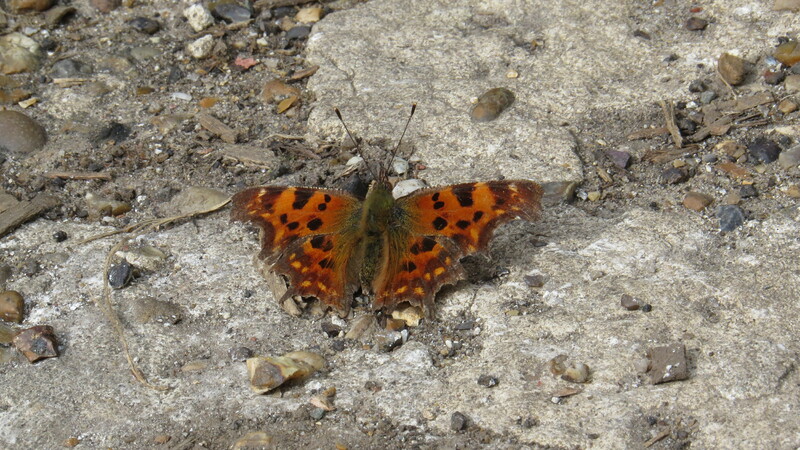 In the cemetery, I spotted a comma butterfly sunning itself on a white road marking. Fortunately the road is very little used, because I saw a butterfly doing the same thing on Wednesday and Friday. As the males set up fiercely-contested territories, it could easily be the same one each time. I’ve gotten to the point where I look for him, and am disappointed if he doesn’t show up. This is a species which is on the wing early, and relies on dandelions and sallow catkins for food, another reason why they favour the cemetery which has the splendid crop of the former. Like Red Admirals and Peacocks, apparently the Comma likes rotting fruit in the autumn. I think I shall have to put out some ageing plums as an experiment. I’ve seen orange-tips, speckled woods and both small and large white butterflies on the wing this week. 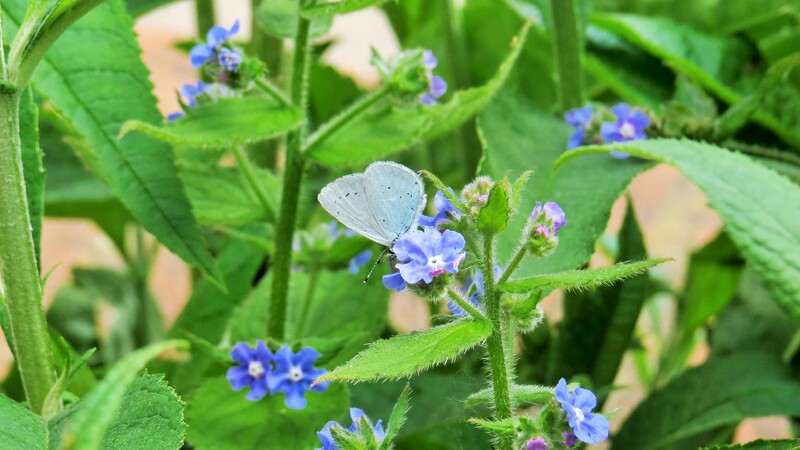 In the front garden, there was this lovely holly blue feeding on the green alkanet, which is proving to be as good a butterfly flower as anything I’ve planted on purpose. I could have saved myself a small fortune in garden plants and just encouraged the ‘weeds’. Although the female does lay her eggs on holly, she may also lay them on ivy, dogwood or pyracantha. The adults prefer to feed on honeydew left by aphids but as it’s a little too early for them yet (in my garden at least) they force themselves to make do with nectar, poor things. 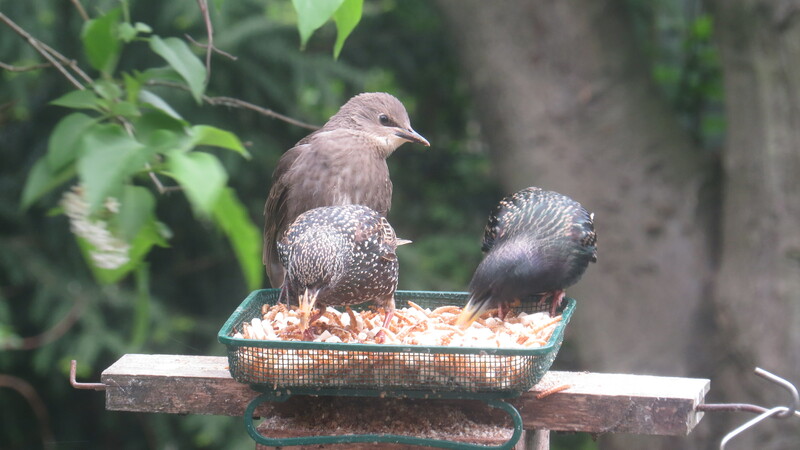 The other big news of the week in the garden is that the baby starlings are out of the nest, and eating what seems like their own body weight in mealworms and suet pellets every day. The one on the bird table below is getting the hang of feeding him or herself, but still prefers mum or dad to feed him/her. The racket is quite alarming: the whitebeam tree sounds like it’s full of folk with some kind of wheezing disease when all the babies are calling at the same time. And of course, I couldn’t close without an update on the foxes. 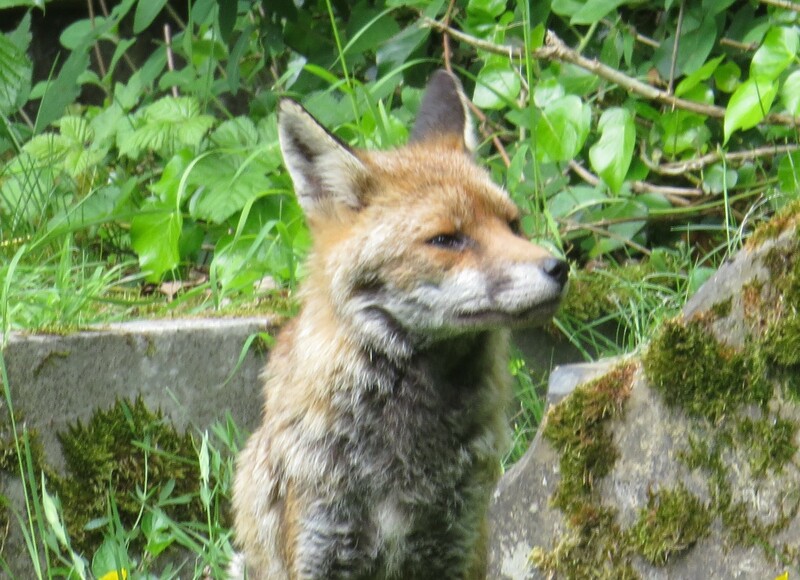 I saw the dog fox and the vixen today, and also got a quick glimpse of the other male fox. 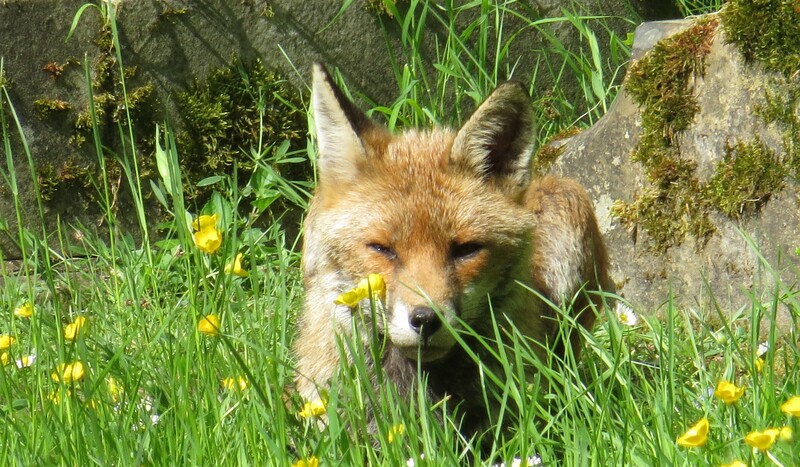 The vixen seems to have her limp back, so I must definitely pick up some arnica, and she might also have a very mild eye infection – how I’m going to do anything about that I have no idea. Both the dog foxes look relaxed and happy and healthy. 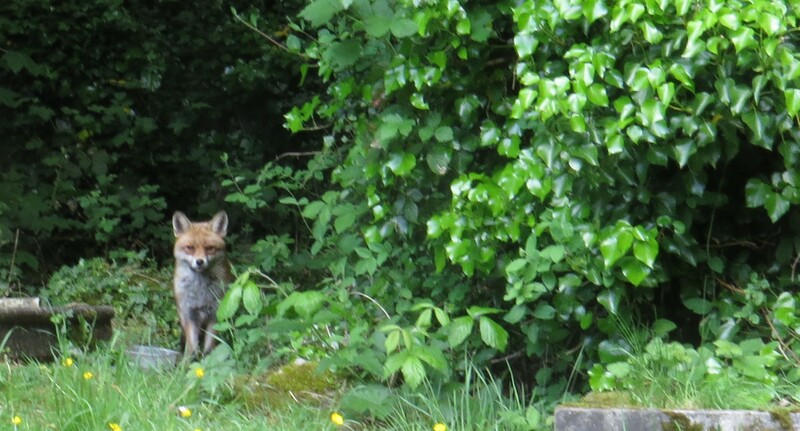 I haven’t seen any cubs yet, though the Dog Unit man does tell me that he found a dead cub by the crematorium. I don’t know whether to be pleased that there definitely are cubs, or upset because one of them has met with an accident, so I shall have to be both. 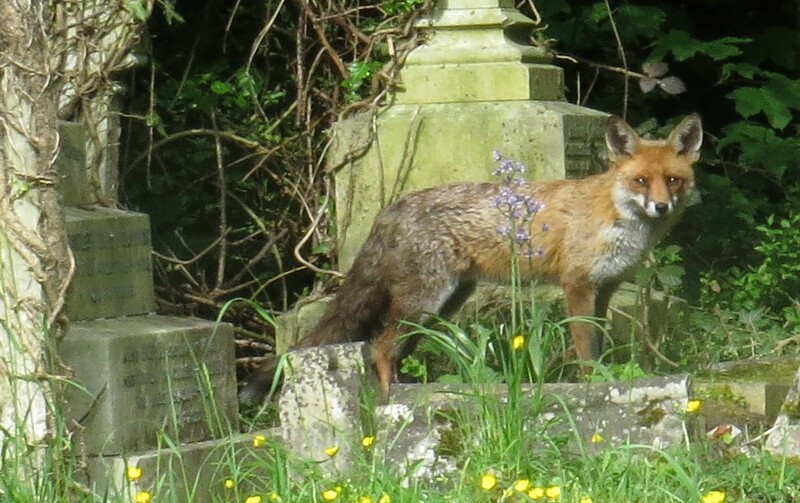 Mortality is horribly high among young animals of all kinds, and foxes are no exception – even in a relatively benign environment such as the cemetery, baby animals can meet with all kinds of mishaps as they explore the world. Nature is very unforgiving of the smallest mistake, and the fact that humans drive around the cemetery as if it were a race track rather than a place of contemplation doesn’t help. The Dog Unit man is planning a crack down on the speed demons this week, and I’m only sorry that I’m down in Dorset with my parents until Fridaay and won’t be around to see him in action. B is going to medicate the foxes for me, so I’m all set. Who knows what the story will be when I get back? Oh lord, are you still there, camera-person? 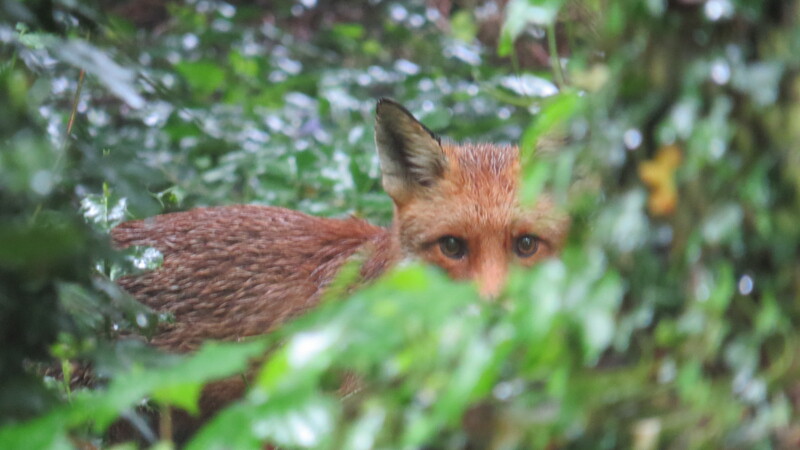 The other dog fox waiting till the vixen and her mate have finished. 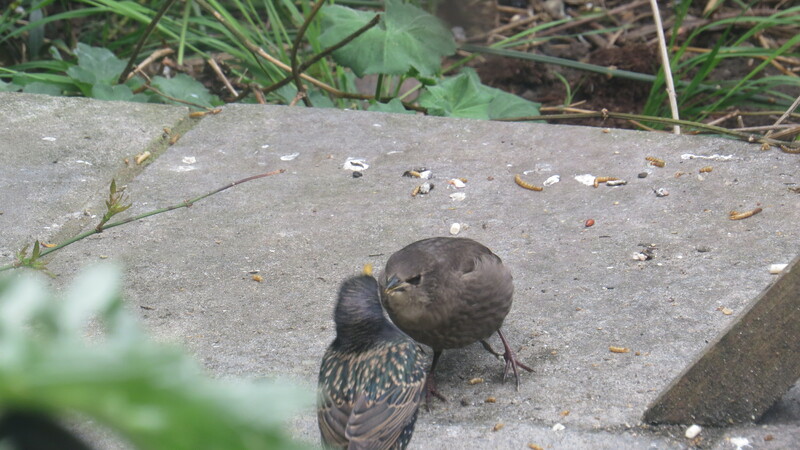 This entry was posted in London Birds, London Invertebrates, London Mammals on May 14, 2016 by Bug Woman. Skip the first part of the post where I was droning on about something else, and just move down to where the photo of the grey evil One is…. Since then, I’ve armed myself with some chemical monstrosity that I’ll be dousing the whole balcony with in the next few days. Last year, untreated, those beasts took over, locust-style and I don’t want all those nightly beetle-bashing sessions again! Hi Beach-Combing Magpie, yes I recognise those vine weevils all too well – it’s amazing how quickly their larvae can devastate a container or a window box. They look so inoffensive and bumbling, too! Good luck with your battle…. HI Teresa, you raise an interesting question. 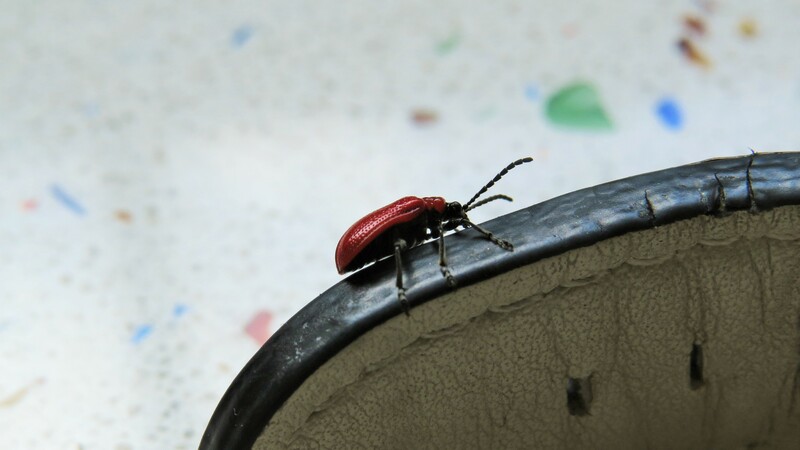 I very, very rarely kill bugs of any kind in my garden – I moved the lily beetle to the bamboo at the end of my ‘plot’, and would much rather relocate than destroy. In fact, if I had a bad infestation of lily beetle I think I might grow something else for a few years :-). And I would never use pesticides of any kind – their knock-on effect on other animals is too extreme. But I know that other people have terrible battles with ‘pests’ that destroy their lovingly-created gardens, and sometimes they decide to take extreme measures to protect them. And who knows what I would do if my whole garden was threatened? But as you rightly point out, it would be deeply ironic if someone called Bugwoman decided to kill the very creatures that she feels most affinity with. I hope that I can always find some other solution than killing. There’s too much of that in the world already.